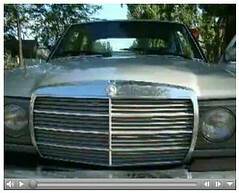 An ode to my '77 Benz. i really liked this video. it gave me the feeling of a pbs show. maybe you could go on "Pimp My Ride" and get outfitted with a surround sound movie theater in the back seat or something. fresh! Yes, this ride certainly needs to be pimped!